Is your Ford car or Van 5 years old or older? If so, here’s a Ford service designed especially for you. Your Ford has been a great companion for years. As it gets older, it may need a little more care. Starting at just €149.00 for cars and €169.00 for small commercial vans, you will benefit from a range of extras that will give you the best service possible for your Ford. Here’s what your Ford Motorcraft 5+ Service entitles you to…. 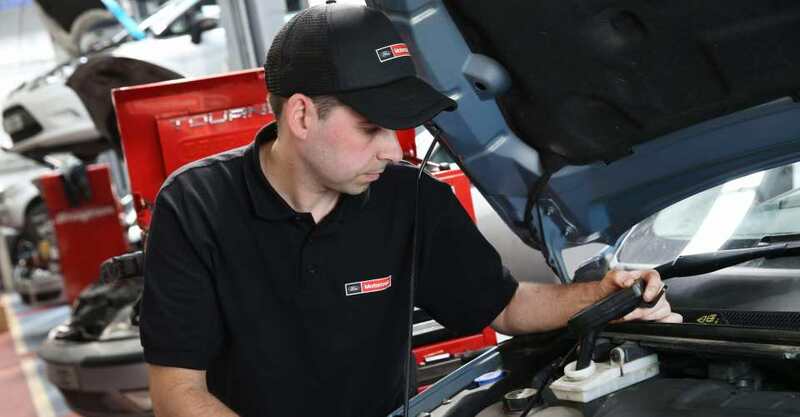 Oil, Oil Filter & Air Filter Change Following a Value Service, your car will leave our workshops filled with Ford specification oil and genuine Ford parts, which provides instant protection the minute you switch on the engine. With the right oil and oil filter, and a Ford genuine Air Filter, your vehicle will continue to run at its peak for longer. Multi-point Vehicle Health Check A comprehensive 40 point health check of your Ford is performed using the latest electronic inspection equipment. Free Check for outstanding Service Enhancements and Software Updates And if any updates are identified we will carry these out for free. Price Match Guarantee (see footnote below) We’re so confident that no one can beat our service price that we’ll match any like-for-like service price lower than ours. Free Car Wash & Mini Hoover We’ll wash the exterior of your car and vacuum the front footwells after your visit to our workshop. NCT Guarantee (see footnote below) Availing of the Ford 5+ Offer will help to take the worry out of the NCT. Having taken a Motorcraft 5+ Service, if your vehicle subsequently fails the NCT/CVRT test within three months of the repairs, your Ford Dealership will cover the full cost of the NCT re-test or half the cost in respect of the CVRT re-test. The value of the re-test will be deducted from the total bill once the value of repairs is in excess of €100 for a Ford car or €150 for a Ford van. National Pricing With the introduction of Ford’s National Pricing list, you’ll always know exactly what the cost will be for the most common type of repairs required on your car – for more information in relation to Menu Pricing, see below. Please note: Car derived vans such as the Fiesta Van and Focus Van fall within the Car Pricing table. 'Part only' prices do not include fitting cost which is extra. *Does not include Water Pump or Wet Belt fitted to 1.8 Diesel Engines. Please call or email for pricing including Water pump and/or wet belt. Notes on the Price Match Guarantee: The Ford Value Service price match guarantee refers to any service quotation received from any licensed independent, or non-Ford affiliated workshops, offering a service price lower than that of the Dealer’s listed price or the national suggested service price, whichever is lower, using Ford genuine parts and where evidence has been provided that the service includes all of the benefits of the Ford Service within a 10km radius. How does the ‘NCT Guarantee’ work? As part of the Ford 5+ Offer, should you agree to have all repairs carried out resulting from the Ford Value Service health check, and your car subsequently fails the NCT test within three months of the repairs, the dealership will be required to cover the cost of the NCT re-test. However, the following terms apply: The value of the re-test will be deducted from the total bill once the value of repairs is in excess of €100. To qualify for the Ford 5+ Offer, the actual test must be carried out within 3 months of the repairs being undertaken by the dealership and a copy of the failure sheet must be presented to the Dealership in full. For more on the Ford 5+ offer see: Terms & Conditions or visit Ford Ireland’s website.